With the promise of a treat, Suri couldn't help but smile as she tagged along with her parents on a visit to renowned Berlin chocolate shop Fassbender & Rausch on Sunday, 5. Suri is wearing Denim Baby-Doll Jumper by Juicy Couture. Suri is weaing Red Surfer Sandals by Sun-San, which she wore first on August 1st. Suri Cruise looks upset (and cries in other pictures) after parents Tom Cruise and Katie Holmes strap her into a life jacket and take her for a dip in the water earlier this week in Sardinia, Italy on Thursday, 2. Suri and her parents play around while waiting to board a helicopter in Potsdam, Germany on Wednesday, 1. 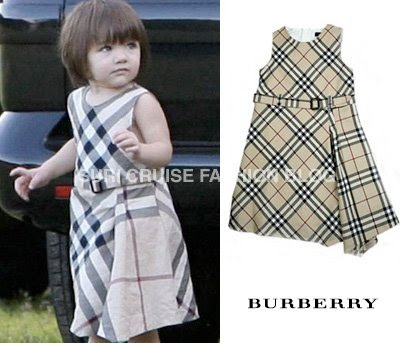 Suri rocks Classic Plaid Dress by Burberry. 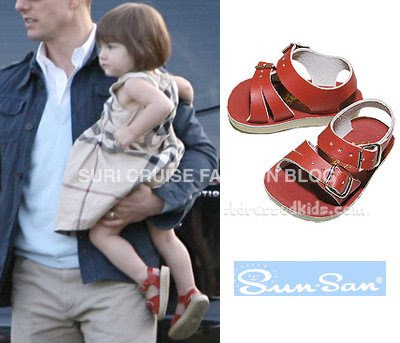 Suri is wearing Red Surfer Sandals by Sun-San. Suri is back in Berlin, and was dining in Bocca Di Boa Restaurant on Sunday, 29. Suri is shopping with mommy in Berlin on Monday, 30. The mother-daughter duo stopped off at Gendarmenmarkt, an oldtown marketplace in the center of Berlin on Tuesday, 31. Suri is wearing Angel T-strap Maryjanes in Ecru by L'Amour, which she first wore on July 15th. Suri watching David Beckham brief debut for LA Galaxy Galaxy play Chelsea FC during the World Series of Football match at the Home Depot Center in Carson, CA on Sunday, 22. Suri is wearing Cecilia Polo Dress by Ralph Lauren Children. Suri is spotted leaving Patsis Restaurant in NYC on Monday, 17. 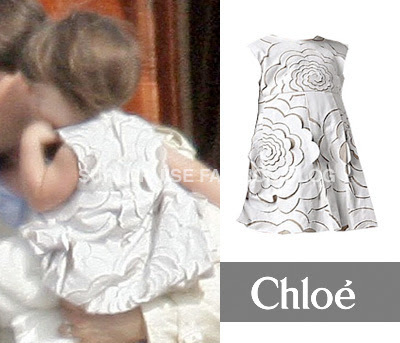 Suri is wearing Floral Cut Patterned Dress by Chloe, which she first wore on June 18th. Suri and her mother Katie, spend a day at Tiergarten Park in Berlin, Germany, on Thursday, 12. The mother-daughter duo accompanied dad Tom Cruise overseas while he films his new movie Valkyrie. Suri is wearing Baby Sea Wees White by Sun San. 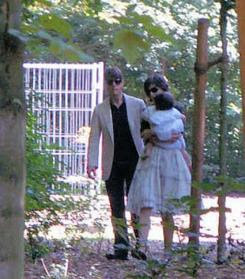 One tiny picture of Suri and her parents visiting Zoo in Berlin on Sunday, 15. ... and leaving Berlin on the same day. Suri is wearing Angel T-strap Maryjanes in Ecru by L'Amour . Suri is wearing Denim Outfit by Burberry. ...leaving Cannes on Saturday, 23. ...enjoying a Wednesday morning out in Cannes. The Cruise clan is in town to join in on the wedding celebrations for fellow Scientologists James Packer and Erica Baxter. 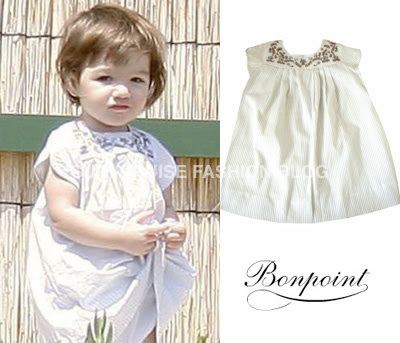 Suri is wearing Cotton Striped Tunic Dress with Embroidery by Bonpoint. ... leaving hotel the Eden Rock Hotel to go to the beach in Cannes on Tuesday,19. ... a refreshing plunge in St. Jean Cap Ferrat. Suri is wearing Little Mermaid Luna One Piece Swimsuit by Eberjey Mini. 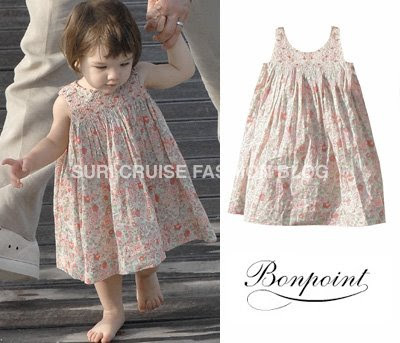 Suri is wearing Smocked Flower Print Dress by Bonpoint. It's Vacation Time!!! Cruise Family arrived to Nice, France on Monday, 18. Suri is wearing Floral Cut Patterned Dress by Chloe. Suri come to visit Katie Holmes on the set of her new movie, "Mad Money," in Shreveport, LA. another visit on the set of "Mad Money" in Shreveport, La. 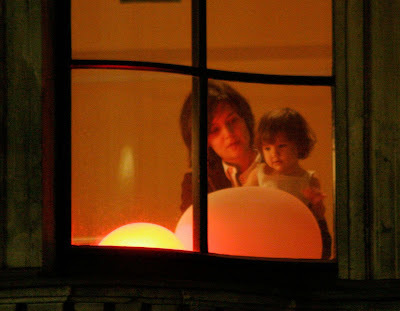 Suri Cruise may have celebrated her birthday on set with her mom last week( NO pictures!!! ), but she was sure to be back in LA to party at Brooke Shields' daughter Grier's 1st B-Day soiree on Sunday, 22. 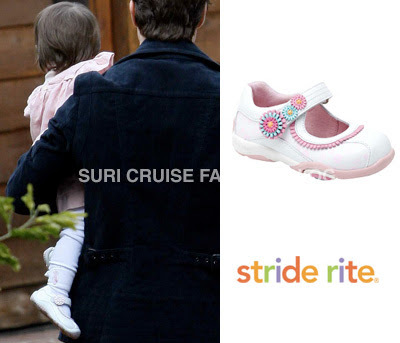 Suri is wearing White Caden Shoes by Stride Rite. and she is missing a shoe... Sunday, 4.
wearing a cute sundress... Sunday, 11.
and ready for St. Patrick's Day in her green plaid jumper... Saturday, 17.
enjoining one more game... Sunday, 18. March was all about Connor's Basketball Games. 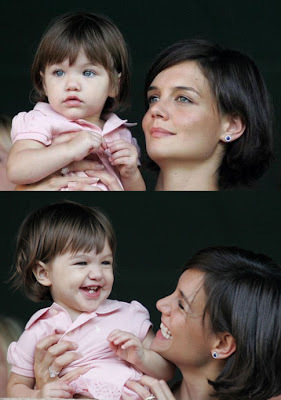 Suri & her parents attended four games in a row... Plenty of candids, YAY!!!! 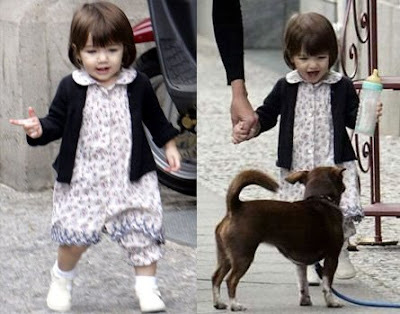 As Suri's mother was all busy attending Paris Fashion Week with her CBFF Victoria Beckham and some Charity Events hosted by Glamour Magazine & Pre-Oscars Parties, there were no photos of darling Suri for almost 2 months! and now Suri was spoted arriving at LAX airport on Thursday, 22. 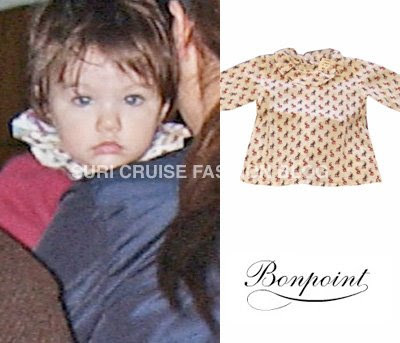 Suri is wearing Ruffle Collar Printed Blouse by Bonpoint. The honeymoon is over for Tom Cruise and Katie Holmes, as they take their precious cargo (in the form of 7-month-old daughter Suri) to the airport in the Republic of Maldives on Friday. According to Splash News, their two week honeymoon has been cut short due to bad weather. Suri is wearing White Crochet Crib Espadrille from The Sweetest Garden Line by Janie and Jack. Tom and Katie exchanged vows at Odescalchi Castle overlooking Lake Bracciano, in front of more than 150 guests on November, 18. 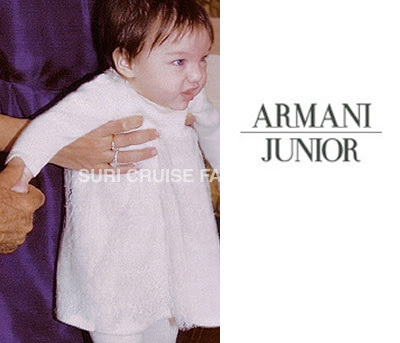 Suri is wearing White Dress by ArmaniJunior. Cruise Family heads out to a pre-wedding dinner party in Rome, where they were joined by famous pals Jennifer Lopez & Marc Anthony, Victoria & David Beckham on Thursday, 16. First candid photos of Suri since her Vanity Fair debut. 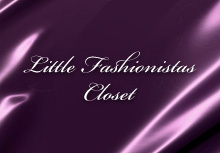 VERY Exciting!!! Lovely Suri accompanies her parents to the Rome's City Hall to take care of some pre-wedding business on Wednesday, 15. Suri is wearing Mille Petales Vinatge Print Dress by Jasmine di Milo.